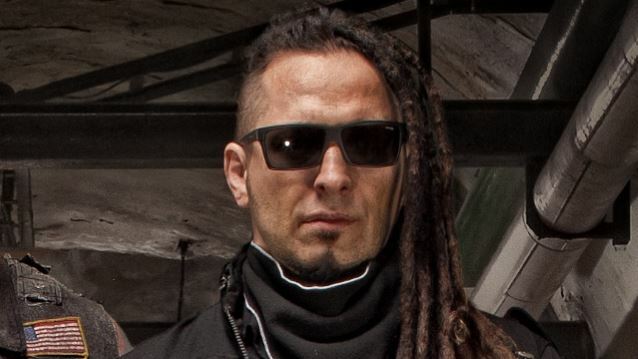 Five Finger Death Punch guitarist Zoltan Bathory was recently interviewed by Rock 105 radio, you can read some excerpts below. About Five Finger Death Punch's upcoming co-headlining U.S. tour with Shinedown, Zoltan said: "When you put together a lineup for a tour, there are many factors: who's available, who's not, who's in the studio, who's not, and who's committed to other tours. So a tour is being planned, like, a year in advance. And we have to look at their timeline; like, what is Shinedown doing?" He continued: "Shinedown, they are an awesome band. Actually, I listen to those guys a lot. I think they write awesome fricking songs. Great voice… That band is a great band, in my opinion. And they have their own fanbase, and it's a huge fanbase. You put these two bands together, and we're gonna fill up massive arenas. And everybody gets equal opportunity; we never limit anybody's sound. It's a co-headline; they bring whatever they want. This is not a competition for who's louder, who's not; it's about bringing back that hard rock family, what it used to be. Whoever comes out to the show should have a good time, basically. And an arena tour means we are inside, so even the first band, it doesn't matter that they go on first; they have lights, they have whatever they want."